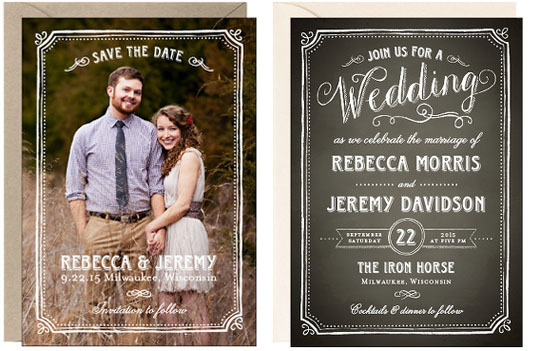 As the first chance to show off your wedding style, Save the Dates are an important part of wedding planning. Here are some helpful tips and tricks to make your mark as a newly engaged couple. Although Save the Dates are available without photos, we love the idea of giving your guests a sneak peek of the happy couple. No matter what style you choose for your Save the Date, the focus is on you and your partner, and a good shot will make your announcement stand out. A lot of wedding photographers feature photo packages that include engagement shots. This is a great time to get some more casual and candid, but professional pictures, while also getting to know your photographer before the wedding day. Dress for the occasion! 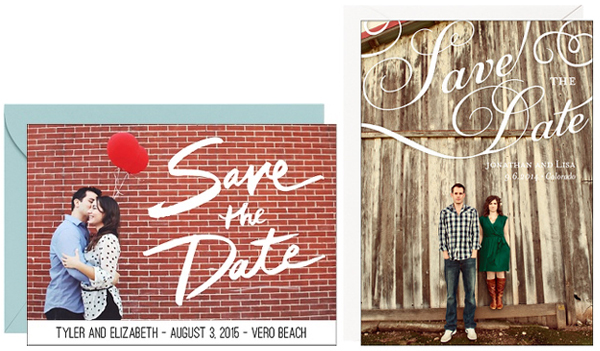 Remember, these are probably photos that you will be seeing for a while (and, of course, on your Save the Dates)! Even if you choose a casual look, make sure it’s put together and timeless, so you won’t mind looking at your photos for years to come. It also doesn’t hurt to coordinate your outfits beforehand – so you’re not matching, but not clashing, either. Shots often look more natural, and are more personal, when a couple visits places that are important or familiar to them. Go to a favorite date spot, or strike a pose on your front porch – if you feel comfortable, your photos will show that. If you’re going to shoot your own photos with a friend, make sure you’re not staring into the sun, and try and pose in front of more solid backgrounds to ensure you pop. Late afternoon, or the “Golden Hour,” with softer shadows and warmer light, is a great time for taking pictures. Select then highest quality file setting on your camera, too. And if you’re looking for tips on how to pose, check out these 101 Tips from The Dating Divas. Of course the picture is the most important part – so if you find a shot you love, chances are you’ll be able to find a style to match it. However, if you have your heart set on a certain look in your Save the Dates (for instance, the ones below both feature large images with a text overlay) make sure you plan accordingly. For the styles shown, you’ll need to ask your photographer to take a shot that leaves blank space where you want the text to be (and usually darker backgrounds work best). It also never hurts to take examples with you, so you and your photographer are on the same page. If you’re planning on personalizing a Wedding Invitation Suite, there’s a good chance you’ll find a corresponding Save the Date. This is the perfect time to give your guests a hint of what to expect on your big day. Karen D., our Design Director, says, “It’s nice to carry a theme, color, or style through your wedding, and Save the Dates are the start of that.” The Chalk Border Save the Date and Invitation, shown below, coordinate nicely without mirroring each other, and create a cohesive experience. Take, for example, how the small tweaks below change the look of our Swirl Marquee Save the Date. And finally, the craftier couple can turn to D.I.Y. for a one-of-a-kind look. Pinterest is a great resource for “Save the Date” ideas, but don’t forget that etiquette recommends you include the date and location, as well as a note that a formal invitation will follow. We love the idea of printing 4″ x 6″ photos and uniquely mounting them on A7 size cards (we have 40 exclusive colors and bulk discounts are available). You can embellish with stamps, stickers, ribbon and more. Paper Source even offers Wedding Workshops, for more inspiration, ideas and tips on execution. Our next one (on D.I.Y. Wedding Invitations) is coming up in April!. Now through April 5, 2015, Wedding Suites and Save the Dates are 15% OFF with code WED15!